Covering the top of your soil can greatly help improve the condition for your plants and help you cut down on garden maintenance. It will help keep water in the soil, control the soil’s temperature, and prevent weed invasions. It can be anything from pebbles and dry leaves, to even cocoa and succulents. Soil heats up slower. Plant roots don’t like heat. In the winter water won’t freeze. Mulch helps with water retention. Early growing plants won’t grow too early. Soil heats up slower. Perennials might bloom late. Slugs and insects love cool damp places. The ground can become soggy. Composted Manure – It’s advisable to properly ripen the manure before use, otherwise you could burn your plants. It’s best used for insulation and slowly releases nutrients into the soil. Leaves – Probably the most universal solution. Has the huge added benefit of attracting earthworms to your garden. Grass Clippings – It’s good for supressing the growth of weeds, but likewise could suffocate your own plants too if you are not careful. Straw & Hay – Decomposes slowly and thus will last the whole growing season. It also serves as shelter for spiders and beneficial insects which will keep pests at bay. Best for vegetable gardens. Cocoa Beans – Exotic and also very revitalizing for your garden beds. Greatly help with moisture control and as a pest repellent. 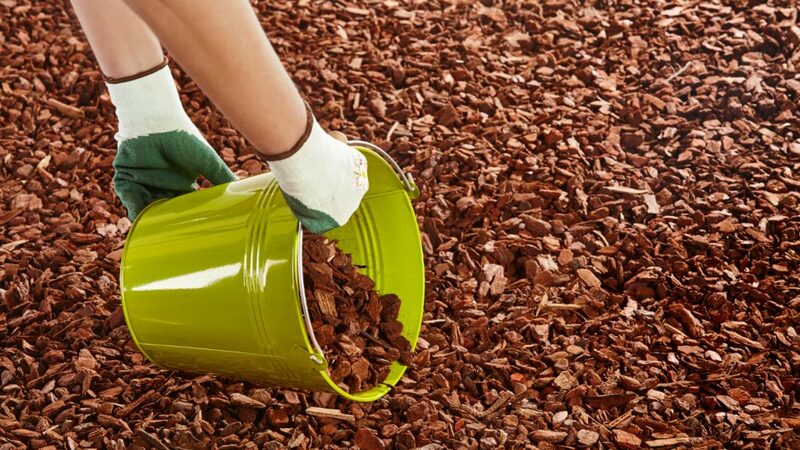 Bark (both softwood and hardwood) – It’s very durable and won’t need a lot of replacement. Is probably the hardest shield for your soil. Living Mulch – Plants like hen and chicks that will spread over bare patches of soil. Can help feed your other plants. Plastic and Landscape Fabric – Great around shrubs and trees in winter as it traps heat. Inadvisable in summer. Not very aesthetically pleasing. Stones – Stones are versatile and can serve many purposes. Use dark stones to capture heat, or light stones to reflect it.